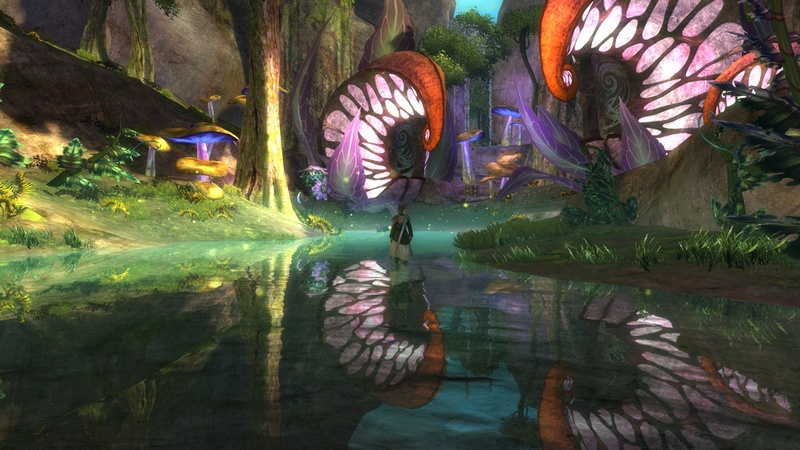 My final entry in Murf’s #NBI2015Safari will bring us back to where it all began, the high fantasy world of Tyria. My first entry was a self-portrait featuring a Sylvari ranger from Guild Wars 2. It is the image I use for most social media services as my personal avatar. Today’s submission is a companion to that self-portrait; it is the image that I use as a header here at Waiting For Rez, on Twitter, and a few other places as well. Whereas the self-portrait reflects a point of decision— whether to continue a life of adventure or retire to relative safety— this image illustrates the beauty one might find if one chooses to press on. Our Sylvari adventurer has continued his journey through the Brisban Wildlands, leaving the path of safety for darker roads. During his wanderings, he discovers a hidden grove within the jungle, forgotten by the outside world. Carefully traversing a narrow passage of damp, moss covered stone, Weakness emerges into a place of oversized, luminous fungi and still waters. He stops to rest for a while. There is no danger here, only the violence of beauty; a sanctuary undisturbed by the industrial machinations and savage wars of the “civilized” races. It reminds Weakness of the Pale Tree, or rather as he imagines the Dream would have been, were it unaffected by the Nightmare. Weakness was born into conflict. His transition from the Dream to the Waking was a tumultuous birth, warring against tooth and claw for a chance at life— what should have been his by natural right. “No one should have to battle for the right to be born,” he thinks, “an opportunity at life should not have to be earned.” The wind ripples the waters at his feet, silently affirming the ranger’s indignation and loss. It is this thought that steels his resolve, the injustice of never knowing the Dream-that-was or a peaceful Waking. He will fight the Nightmare Court. His world may be tainted by the narcissistic cruelty of Sylvari twisted by the Nightmare, but that does not mean it must remain that way. Weakness rests cross-legged in that place for several hours, allowing the saturated hues and laughing curves to take root in his heart. This sanctuary will be the image that burns in his mind when he is hopeless, wearied, and afraid. The hidden grove of Auroria’s Remains will be the tattered banner he will carry, the hill he will die on. Should he live to see the dragons destroyed and the Sylvari people saved from themselves, Auroria’s Remains will be the place to which he retires, but not until he secures the right for all Sylvari— for all Tyria— to dwell in a haven of their own choosing as well. Looking one last time upon the grove, Weakness bids the maiden farewell; he will likely never see her again. Broadsword in hand, he disappears once more into the shadowy crest that hides this sanctuary from the horrors to which he returns. Surprised I’m not seeing more GW2 screenshots being entered into the challenge. It’s one of the best looking games out. Yep, that was me! I submitted it a month or two ago, so it’s kind of a coincidence they used it this week. Most definitely! I had to look up what “high fantasy” was though before I could select a screenshot. I wasn’t exactly sure what constituted high fantasy from low fantasy or regular fantasy or whatever the other options were, lol. this has got to be one of the best High Fantasy shots I’ve seen to date. Gorgeous background, really intense landscape. Total thumbs up here! Thanks! It’s definitley one of my all time favorite screenshots. I don’t even play GW2 all that much but it is such a beautiful game and that Sylvari is one of my favorite MMO characters.